Imagine a week at the office where much of each day is spent 5,000 feet underground. It’s all in a day’s work for PNNL researchers as part of DOE’s collaborative Enhanced Geothermal Systems project, or EGS Collab. The $9 million multi-lab EGS Collab is designed to perform field experiments and numerical simulations to understand the creation of fracture networks and fluid flow through those networks deep underground. The project is funded by DOE’s Geothermal Technologies Office and led by Lawrence Berkeley National Laboratory. When cold water is pumped through small fractures in the Earth’s subsurface, its contact with hot rock heats the water, which can be brought to the surface for conversion to electrical energy. This creates a clean energy source that could be harnessed to power 100 million homes across the nation. But barring locations such as active volcano centers or areas with very high temperature gradients, many geographical locations are not typically conducive to conventional geothermal energy production. Scientists need to have a keen understanding of subsurface fractures and fluid flow—key elements for producing geothermal systems—at these locations. They also need to better understand how to enhance permeability—the ease at which fluid flows through subsurface rock. 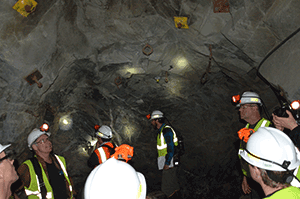 The EGS Collab, a three-year project that began in early 2017, is working to gain this understanding, using the Sanford Underground Research Facility in Lead, SD as its underground laboratory. The SURF—considered the deepest underground laboratory in the United States—is formerly a gold mine with infrastructure that can transport a collection of researchers 5,000 feet underground. Temperatures within the SURF’s subsurface are 100 degrees Fahrenheit—elevated enough to react to the injection of cold water. Here, the collaborative team—which includes PNNL’s Mark White, Tim Johnson, Chris Strickland, Vince Vermeul, and Alain Bonneville, who leads PNNL’s arm of the collaboration—is working to enhance useful permeability in crystalline rock by stimulating hydraulic and natural fractures that will allow them to study fluid flow through those networks. With its national lab partners, PNNL has lent modeling expertise, as well as muscle, to the effort. Ahead of experiments scheduled for this spring, the entire EGS Collab modeling and simulation working team identified and quantified the nature of planned experimental work, such as hydraulic fracturing and stress alteration due to thermal cooling. PNNL’s White, a numerical simulation expert, led the numerical modeling and simulation working group’s effort to ensure the environment will be optimal for the experiments. The modeling considered aspects such as preferred orientation of boreholes most compatible with the rock structure and the potential number and magnitude of seismic events associated with hydraulic simulation. The effort took the research team 5,000 feet under the Earth’s surface, via a 1930s-era hoist. The team discovered that the temperature gradient sufficiently altered the stress field of the rock, and that—to achieve optimal experimental conditions—the initial forecasts of stimulated fracture shapes and apertures needed to be recomputed for a stress gradient toward the drift wall—the tunnel wall that follows the length of rock formation. “It was an excellent collaborative effort among scientists to discuss pitfalls and limitations, as well as recalibrate when we knew we were initially naive about the temperature environment around the drifts,” said White. The research team also worked to design and prepare the subsurface test bed. They performed core logging to understand the geology of the crystalline rock and identify natural fractures. They drilled a series of eight 4-inch outside diameter boreholes—which typically takes one week per borehole—that will be equipped with electrodes and monitoring equipment to ultimately glean the experimental data. The network of fractures will be created between sets of boreholes, where the monitoring equipment within the boreholes can shed light on fracturing and fluid flow at such sites. The research team sees this point in the EGS Collab as a time to learn. Characterization data from the boreholes have been collected, and now the numerical simulators can re-simulate knowing there is variability in the stress state of the rock to make a more accurate prediction of what the experiments will look like. The knowledge gained from these experiments will provide needed data to the Frontier Observatory for Research in Geothermal Energy Project, which is tasked with developing technologies to harness and use this energy source. Other national labs besides Lawrence Berkeley and PNNL involved with the EGS Collab are Sandia, Lawrence Livermore, Idaho, Los Alamos, Oak Ridge, and National Renewable Energy Laboratory. Mark White presented a paper on the state of numerical simulation for EGS at the Stanford Geothermal Workshop on February 12.